New scientific findings suggest neutrino detectors may play an important role in ensuring better monitoring and safer storage of radioactive material in nuclear waste repository sites. Researchers at Johannes Gutenberg University Mainz (JGU) have made calculations to ascertain the neutrino radiation of spent nuclear fuel emits. Their figures show that neutrino detectors could be useful in certain scenarios. Neutrinos undergo almost no interaction with matter, and so they can penetrate practically unhindered through the Earth and any man-made shield. "Every second about 100 billion neutrinos per square centimeter strike the Earth from the Sun, both day and night. Because neutrinos only weakly interact with matter, they are among the most difficult elementary particles to detect," explained Professor Joachim Kopp from the PRISMA Cluster of Excellence at Mainz University. Kopp is an expert in the field of theoretical neutrino physics and received an ERC Starting Grant for his research in 2014, one of the most highly endowed awards from the EU. The beta decay of radioactive fission products generates neutrinos in very large quantities. However, a minimum energy of 1.8 mega-electron volts is required to detect these particles via the process of inverse beta decay. Only then can they be registered in a scintillation detector, a tank filled with special mineral oils. The high-energy particles interact with the protons in the tank, emitting a characteristic light signal. 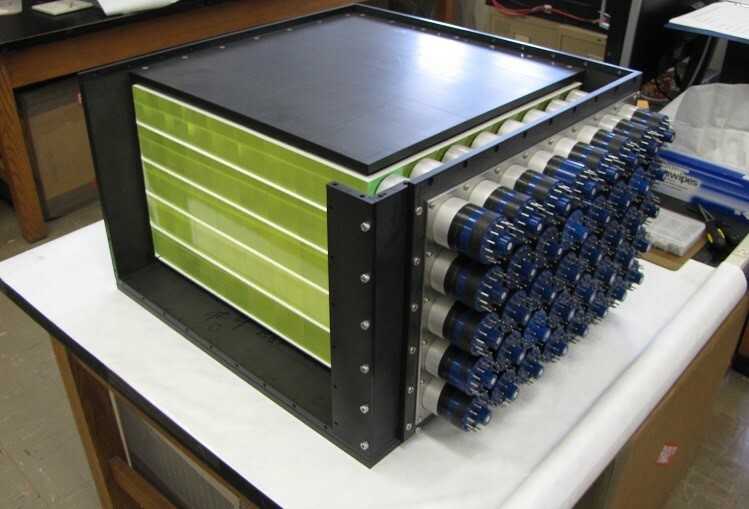 Such neutrino detectors are already being employed experimentally to monitor nuclear power plants while in operation. However, for monitoring stored nuclear waste there are, as yet, no detectors. "In-service reactors produce considerably more neutrinos than decommissioned reactors or stored radioactive material," explained Kopp, noting that monitoring the whereabouts of nuclear waste is particularly important at present for security reasons. For their paper in Physical Review Applied, Joachim Kopp and Vedran Brdar from JGU and Patrick Huber from Virginia Tech in the U. S. first calculated the neutrino flux emitted by radioactive strontium-90 and other fission products in spent nuclear fuel. They then considered several scenarios detailing how or where the emissions could be detected. In one of these, a suitable detector would be particularly useful for monitoring above-ground storage facilities, for example, on-site at nuclear power plants. A neutrino detector in this scenario could detect if radioactive material had been removed without being documented. According to the calculations, measurements using a detector with a capacity of 40 tons would have to run for about a year. "That sounds like a long time, but all that would be required would be to position the detector and wait. The big advantage is that we could verify the contents of a container without ever having to open it up," explained Kopp. It would usually be enough to place the detector 10 to 100 meters away, for example, on a truck trailer. According to Kopp, this method might be particularly appropriate in trying to ensure non-proliferation of nuclear weapons-grade material, which is why the European Atomic Energy Community EURATOM has already expressed an interest in this research. In a second scenario, the physicists calculated a situation in which underground repositories are to be monitored, giving as an example the proposed Yucca Mountain repository site in Nevada. According to this, a significant neutrino flux would be detected, even on the surface of a small 10-ton tank. "However, some realistic hazards, such as the escape of very small quantities of radioactive material, would unfortunately not be detected," said Kopp. A third scenario that the scientists dealt with in their calculations was detecting incompletely documented storage facilities, such as those at the Hanford Site, a now-disused nuclear complex in the U. S. state of Washington from the time of the Cold War. "In this case, the current detector technology is still not entirely sufficient, among other things because cosmic radiation distorts the measurements," said Kopp. However, the first prototypes for such detectors avoiding this problem already exist. 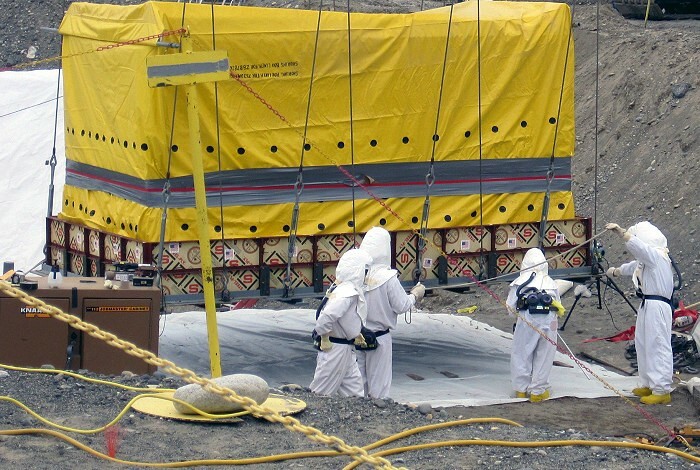 Decontamination of a disused nuclear complex in the U. S. state of Washington. Such measures could be supported by employing antineutrino detectors.